Diastasis recti is caused by the reduction of the consistency of the intercrossed fibers that make the linea alba, generating a separation of both aponeurosis of the rectus abdominis muscles. Nowadays, there is no consensus on the surgical technique or indications for the treatment of diastasis recti. If is symptomatic or associated with midline hernias, the surgical treatment of both pathologies at the same time could be recommended. The most common technique used is by the way of an abdominoplasty in patients with excess abdominal skin and subcutaneous cellular tissue. However, a mini-invasive approach presents as an alternative procedure to the most commonly used technique for its treatment. A 63-year-old man with a history of a conventional cholecystectomy was referred to our department for an incisional subcostal hernia and chronic back pain. Physical exam also showed an umbilical hernia without complications and a bulging of the midline above and below the umbilicus that caused the patient an aesthetic discomfort. 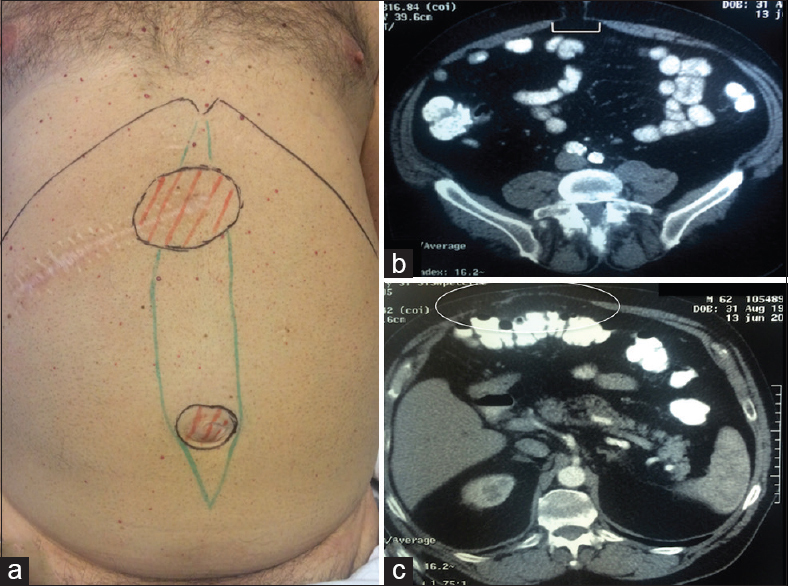 Computed tomography (CT) confirmed the diagnosis and showed diastasis recti measuring 6 cm [Figure 1]a,[Figure 1]b,[Figure 1]c.
We decided to perform a subcutaneous video-endoscopic repair of umbilical hernia and subcostal incisional hernia with plication of both aponeurosis of the recti muscles [Figure 2]b and [Figure 2]c. Finally, a polypropylene mesh measuring 15 cm × 10 cm was placed in the supra-aponeurotic space (onlay) and fixed using an absorbable strap fixation device [Figure 2]d. Therefore, we corrected all pathologies simultaneously. The patient underwent an uneventful recovery and was discharged at 24 h post-procedure. Drainage was placed in the supra-aponeurotic space to prevent post-operative seroma formation and was removed at 7th post-operative day. His long-term follow-up was asymptomatic with no complications. Controversy exists over the surgical indications of diastasis recti. The most accepted are: for symptomatic reasons, due to aesthetic problems (especially in young women after pregnancy) or when is associated with other midline hernias. For the study of diastasis recti, CT scan or ultrasonography can be used. Both methods are reliable for the measurement of the separation of the rectus muscles. CT scan has the advantage of using bony ridges for that measurement and also can show other associated hernias. Different options have been proposed such as conventional surgery, with abdominoplasty or laparoscopic approach. To our awareness, there are few published articles in the literature in which a totally endoscopic access is employed for the treatment of diastasis recti associated with midline hernias. Bellido Luque et al. described the subcutaneous endoscopic approach as a new alternative to treat diastasis recti. For this endoscopic approach, the patient is positioned in supine position with both legs open and the surgeon is located between them. A 10 mm incision is made in the suprapubic midline and a space is created between the subcutaneous cellular tissue and the superficial aponeurosis with blunt dissection. A 10 mm trocar is introduced for the optic and then 5 mm trocars are placed under direct vision on each side of the midline by around 5 cm. 12 mmHg CO2 was used to maintain a correct work space. Under endoscopic vision the supra-aponeurotic space is dissected exposing the linea alba and superficial aponeurosis until we reach the umbilical region. The umbilicus was desinserted above the hernia sac, reintroducing it into the intra-abdominal compartment. Dissection continued until reaching the subcostal incisional hernia [Figure 2]a. We also dissected and reintroduced the sac. The plication of the aponeurosis of the recti muscles was done with two continuous non-absorbable barbed sutures from the subxiphoid to suprapubic region [Figure 2]b and [Figure 2]c. Then, a polypropylene of 15 cm × 10 cm mesh prosthesis was introduced in the supra-aponeurotic space (onlay) and fixed with securestrap [Figure 2]d. Finally, the umbilicus was reinserted to its normal position to the plicated fascia with an intracorporeal knotting. In some cases diastasis recti plicature, even though is effective, can lead to and excessive tension, and therefore, increased post-operative pain or higher risk of late recurrence. In these cases, in our opinion, sometimes may be necessary to reduce the rectus abdominis suture tension by dividing the external oblique muscle fascia close to the semilunar line and hence medialising the rectus abdominis muscle (component separation). In 1990, Ramirez et al. described the 'component separation' technique for the reconstruction of ventral hernias. Using this technique, up to 10 cm of unilateral recti advancement can be achieved. In 2007, Rosen et al. described a videoscopic component separation technique in a porcine model and then both approaches were compared by Giurgius et al. They concluded that the last one has advantages over the open technique due to a reduction in wound complications. In our opinion, this technique is not only useful for ventral hernia repairs, but also for diastasis recti surgery. The use of a reinforcing mesh aims to reduce the rate of recurrence, especially in patients with 6 cm or more diastasis rectus size. In conclusion, in patients without excess skin or subcutaneous cellular tissue, this approach to diastasis recti associated with midline hernias is a feasible and reproducible method. It has aesthetic advantages, allowing simultaneous correction of all existent pathologies, with minimal complications. Carreirão S, Correa WE, Dias LC, Pitanguy I. Treatment of abdominal wall eventrations associated with abdominoplasty techniques. Aesthetic Plast Surg 1984;8:173-9. Ramirez OM. Abdominoplasty and abdominal wall rehabilitation: A comprehensive approach. Plast Reconstr Surg 2000;105:425-35. Bellido Luque J, Bellido Luque A, Valdivia J, Suarez Gráu JM, Gomez Menchero J, García Moreno J, et al. Totally endoscopic surgery on diastasis recti associated with midline hernias. The advantages of a minimally invasive approach. Prospective cohort study. Hernia 2015;19:493-501. Nahas FX, Ferreira LM, Augusto SM, Ghelfond C. Long-term follow-up of correction of rectus diastasis. Plast Reconstr Surg 2005;115:1736-41. Rosen MJ, Williams C, Jin J, McGee MF, Schomisch S, Marks J, et al. 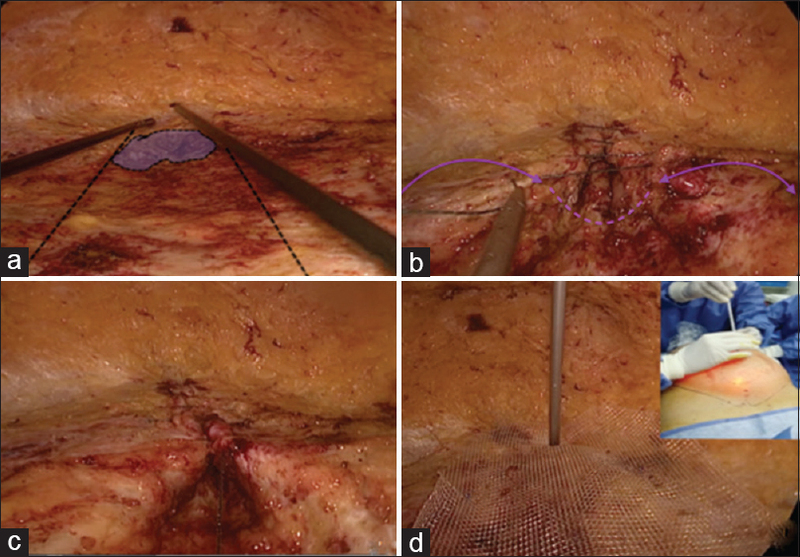 Laparoscopic versus open-component separation: A comparative analysis in a porcine model. Am J Surg 2007;194:385-9. Giurgius M, Bendure L, Davenport DL, Roth JS. The endoscopic component separation technique for hernia repair results in reduced morbidity compared to the open component separation technique. Hernia 2012;16:47-51.